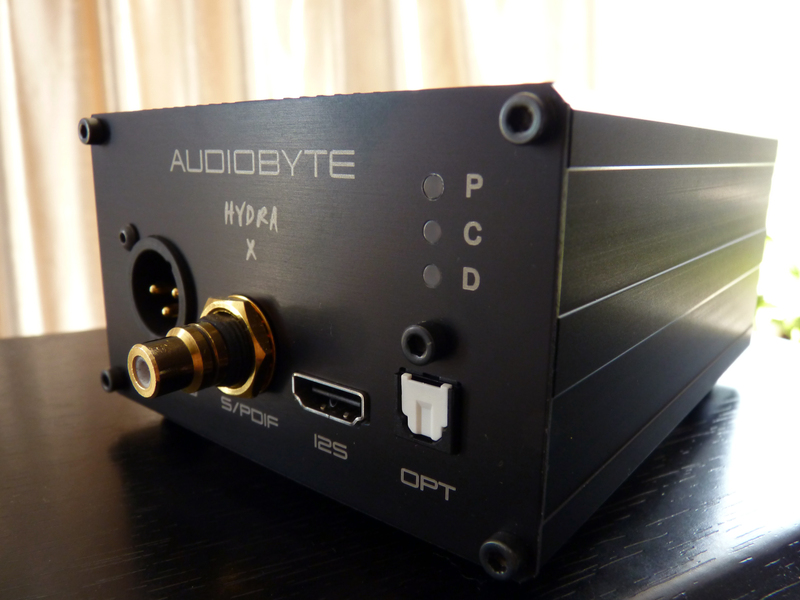 The company I am talking about is Audiobyte. The owner, and main engineer is Nucu Jitariu. I have heard of him from Sandu during the last few years. From what I have heard, he is a legend throughout the audiophile society in Romania. It has come to my attention that Nucu worked with some very popular audio companies like PS Audio, Wadia, MSB, Goldmund. So yes Nucu and Audiobyte has some real experience with some of the bests products out there. 1. Was this always what you’ve set out to do and for how long have you now been into audio? My background is in economics but I found myself more into engineering which is my passion ; this passion drives my entire team. I’m into audio since I was a boy, but seriously for about 15 years. 2. What drives your passion? My idea is to make real audio research and bring it on the market in cost-effective solutions – and offer the sound, not the box. 3. I heard that you collaborated with other companies. Can you tell us which ones and what products did you help create? 4. Would you please describe your current (available or in development) line of products? We have the Audiobyte products, more or less related to computer audio, and the classic Rockna line. 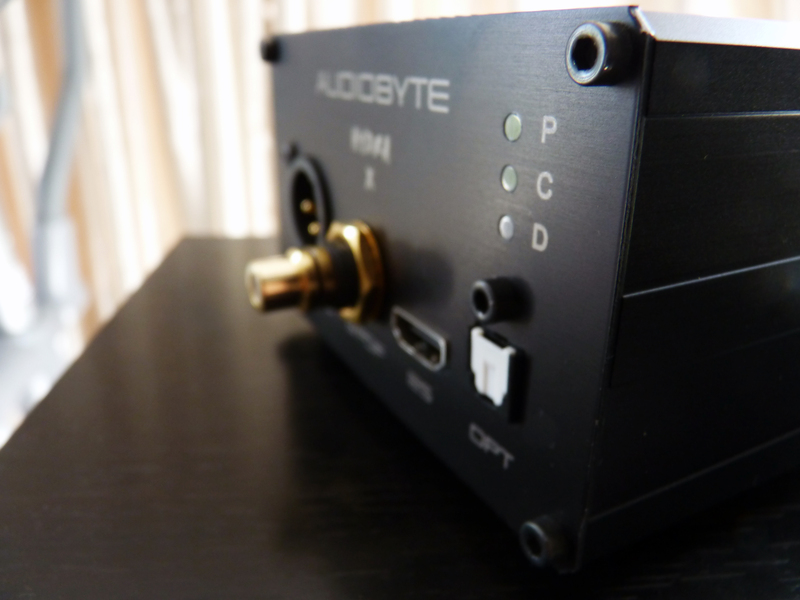 We have a few exciting technologies developed for Rockna which migrated into Audiobyte – let’s take for example the Silver Dragon dac , which have a lot of stuff taken from Wavequest dac. For Rockna we’re building now a bluray transport/player with dsd capability – some sort of ultimate machine for spinning discs – I know that’s almost romantic these days, but I just cannot help it… will have also network connection to be fully featured..
5. What is the product you’re most proud of and why? The product that I’m most proud of …is not ready yet. We are working on our own conversion technique which uses no dac chips.. will be probably released into the Hydravox dac. 6. You have such a great experience and you make terrific products. Why don’t you invest more in marketing since not many have heard of your company? If I would have invested in marketing then I would have had to cut from R&D …which was not an option for me, and still not much of an option today. We’re not a money-driven organization, in a sense that profit is not our primary goal . We put more accent on making good stuff. Well, I know it is not going to win the Miss USB Interface World contest, and to be frank, it did intrigue me, but haven’t had stellar expectations when I first saw it. However, I am an engineer, and the results interest me much more than just the looks. Also the specs drew my attention even more, as it really looked like a high end product. I have called Audiobyte and talked directly to Nucu, asking him to send a unit for the review. He was kind enough to send one, and I must say it really was one of my most interesting WOW moments throughout my journey until now. I did not expect this, nor did I want this, as this isn’t a very cheap component to add to your system. However, I must say that the difference was incredible! Mark my words, the sound was entirely brought to another level. It was like I bought a much better dac/amp. 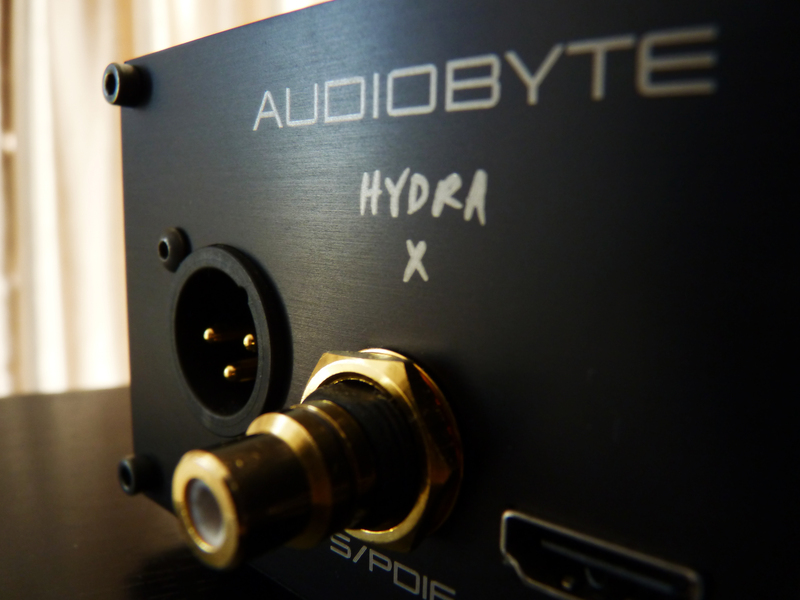 Hydra was designed to get the most out the PC sound. It eliminates the jitter and re-clocks the signal. It isolates your audio gear from the noisy PC environment. 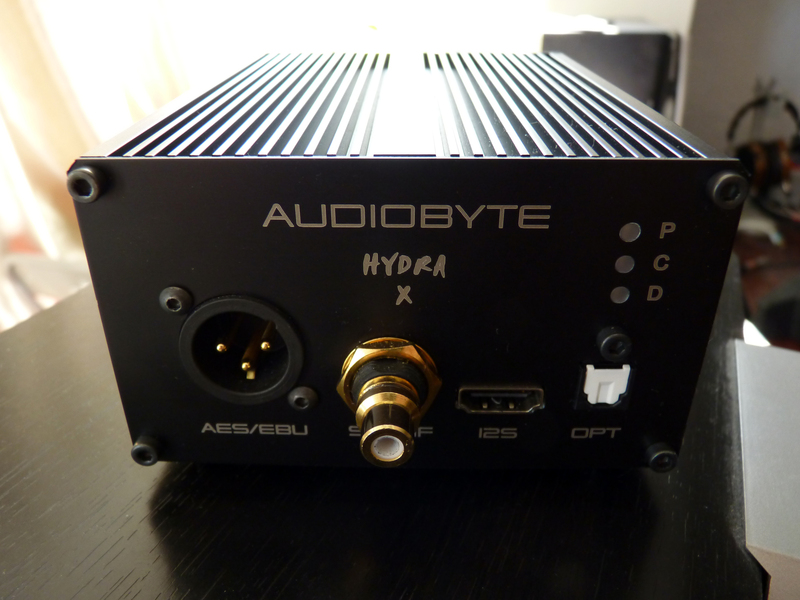 At the heart of the Hydra, you can find the Spartan6 FPGA which also supports raw dsd audio streams. You can check real graphs of these ultra-low phase noise clocks here. The clocks are system masters. In order to remove any jitter induced by the FPGA circuit itself, special retiming is applied just before the Hydra outputs. The usb transactions are processed at high speed with the help of an ARM processor. One other thing I like about it, is the fact that it runs on battery, giving it clean power. This battery gives you ~9h of music play time, which is not bad at all. You should look here for full specifications. Ok, I think it is time to get to what is really important, the sound! I will tell you some of my impressions on a few songs. 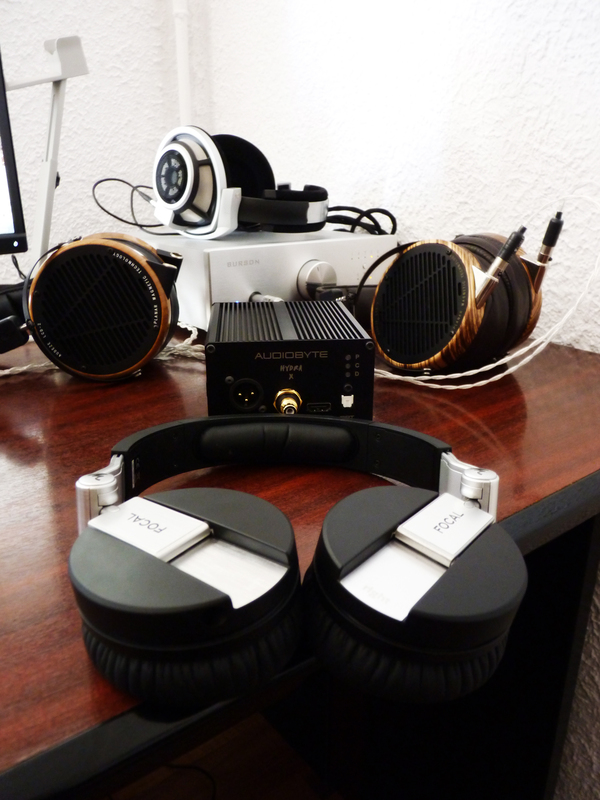 The tests were made with Burson Conductor, Audeze LCD2, Audeze LCD3, Sennheiser HD800 and Focal Spirit One. The sound was clear as a mountain river. Young Leonard’s voice was flowing with great ease throughout all the incredibly detailed instruments. The openness of the sound was amazing. I just stood still and listened..and listened… carried by the music. The headphones were just a window to the music. The sound was incredibly clear. Just loved the voice, it was just mesmerizing. The clarity with which it flows like a musical river to my ears was just amazing. The soundstage was fantastic, holographic. The instruments were incredibly detailed and very very well placed into space. Ok, so the time presented itself with some “ticks” I have never heard before. Again the sound was so incredibly clear and detailed that it opened the sound and not by a little. The bells were incredible. If I close my eyes I can see the bells well positioned all around me. The voice was crisp clear with excellent texture. I, again just got caught in the music forgetting about anything else. Hanz Zimmer – The Dark Knight Rises- Mind if I cut in? The bass had more impact and body. It gave me the impression that it goes deeper and has more detail. It is 4:30 in the morning and I cannot go to sleep because of this awesome sound. The morning was approaching fast so I put this song in the queue. It really woke me up…for a few minutes…The soundstage was just amazing. The violins had an excellent extension, vibe and texture. If i closed my eyes, the orchestra presented itself all around me. It is hard to describe what this little black box brings to Burson Conductor. I have first tested it with Audeze LCD2. 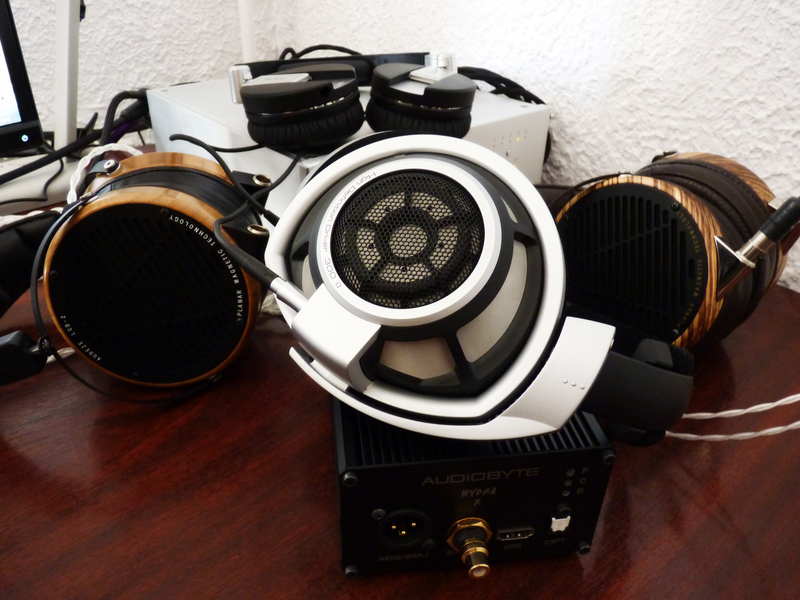 Lately I have listened more to HD800 due to its’ superior dynamics, details, soundstage, transparency… etc. The hydra did some voodoo magic with Audeze LCD2. It really brought them to another whole level, improving them exactly where I felt they were lacking. The sound became a lot more clear, opened and detailed and the dynamics were just excellent. Besides that, it made the bass deeper with more impact. My problem is that it also improved the HD800, and actually, these qualities were felt with all the headphones I have tested it with. The headphones became just a window to the music, there was nothing between you and the music. Imagine that you are looking through a steamed/dirty window and then you open the window and you can see all with excellent clarity. This is what Hydra did, it opened the window, and I must say that I don’t want to close it again. For me it was a one way trip. I did not imagine something like this to make such a huge difference, but it was one of my best WOWS in my whole journey. And all of this in one box! You don’t have to get all the m2tech stack with all the interconnects. I loved this product so much that I wanted to hug Nucu for such a great job that he did. Whenever he will come to Bucharest, the beer will be on me! He is an excellent engineer and I have become one of his greatest fans. Guys, this USB interface is really something else. You should really try it! I guaranty you that you will not regret it. So I must say it again, thank you Nucu, you are one of the people that makes me proud to be a Romanian! Good job and keep at it! I really can’t want to hear his other products! On “soundnews.ro” say good interface usb of Conductor: http://soundnews.ro/2012/11/19/burson-conductor-simplicity-squared/. Did you install the appropriate drivers? Of course I did. It is in a completely different league.